Here I list everything else which you may find useful in terms of learning more about these styles of rhythms. I include software programs which cover sample libraries and can be used in music creation programmes. Also I list physical hardware which is dedicated to these styles of percussion. HTP-Darbukator series is a virtual ethnic percussion free style players for all popular Middle Eastern rhythms. - HTP1 Darbukator Maksoom - HTP2 Darbukator Oriental Beats - HTP3 Darbukator Extreme -HTP4 Darbukator Desert Drums. Do we need another ethnic instrument? In the big variety of ethnic instruments and libraries around it's hard to answer "yes", But we don’t offer just another instrument, our Darbukator series offer a new way of playing it will give you the natural sound of a real player , You have to listen to believe. Our partner company Vibration is an audio and video production house founded in 1990, we used their studios for recording and mastering classic and modern ethnic beats from the middle east area , and because we are originally a production house we have the access to all the best percussion players in the region to give you more complexity and quality. Product review from manufacturer's site. 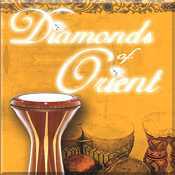 3.4GB collection of exquisitely performed and recorded Arabian percussion loops from master percussionist, Issam Houshan, covering a host of traditional rhythmic styles to create a comprehensive collection of Middle Eastern percussion loops. Totalling 1,124 loops, Rhythms of Arabia covers Baladi, Malfuf, Maqsum, Saiidi, Chift (Chiftitelli) and Saudi playing styles, all played with authentic instrumentation including Dehollah, Duff, Riq, Tabla and more. The collection is presented in multiple formats (24-bit Wav, Apple Loops, Rex2) and all loops are tempo labeled. ROOTS THE MIDDLE EAST AND NORTH AFRICA. Roots of the Middle East & North Africa takes you on a journey to countries like Saudi Arabia, Algeria, Egypt, Syria, Iraq, Libya, Tunisia, Morocco and more. The most authentic percussion hits and rhythms, straight from these regions, are sure to add the truest sound to any traditional or classic production as well as give dance tracks a flare that is otherwise unattainable. Roots of the Middle East and North Africa was produced by classical pianist, orchestral arranger, and synthesist Norair Sarkissian and performed by accomplished percussionists Mark Assaf, Gary Jaklian, Fareed Suleiman and Ghazi Baradah. 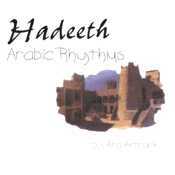 Hadeeth - Arabic Rhythms was produced by drummer, producer, and engineer Ara Antranik. Antranik played the drum kit and sakat (finger cymbals), and master session musician Haytham Ballat played the other percussion. Each collection consists of a single CD. Although their titles are different, both focus on similar ethnic origins and cross into separate styles. The two also cover a broad swath of rhythms from North African countries such as Morocco, Algeria, Tunisia, and Egypt; Saudi Arabia; and the Fertile Crescent (Syria, Jordan, Lebanon, and Iraq). A number of rhythms appear on both CDs, including Adani (from Adan, capital of Yemen), Ayoub (Persian Gulf), as well as Maksum and Malfouf (both popular Egyptian and Fertile Crescent rhythms). You'll also find examples of Karachi, Falahy (an Egyptian farm rhythm now popular in modern dance music), and Baladi (common across the Middle East) patterns. 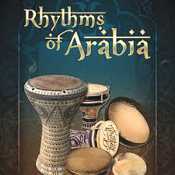 Rhythms unique to the Roots collection include Katakofi, Bambi, and Sudasi, and those only on Hadeeth include Okruk, Aksad, and Hachah (traditional Iraqi). The spellings of those styles differ on each CD. 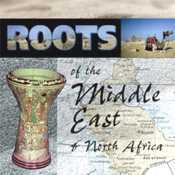 Roots focuses completely on hand percussion; Hadeeth adds drum-kit examples to the hand-percussion loops. Both include one-shots of single instruments at the end of each disc. Several instruments appear on both discs, including the tabla (known in the West as the dumbek), the duhollah (a large bassy dumbek), and the tabl (a two-headed drum that is worn around the neck and played with sticks). Hadeeth differs from Roots by adding the contemporary tabla (a plastic-head dumbek), finger cymbals, duff, and tar (a thin-framed drum). Root has its own unique set of instruments, which are the katem (similar to a conga), mazhar (a katem with metal rings around it), merjana, tayaran, and taoyan. People who are not familiar with music from those regions should be aware that the same instrument can have different names. For example, the Roots instrument listing describes the riq as a Middle Eastern tambourine and mentions that it is also call a daff. However, a daff has a different meaning in some other cultures, in which it refers to a type of frame drum. Moreover, instruments from the Middle East often have similar names. For example, be careful not to confuse a duff (a Persian zarb) with a aforementioned daff. Big Fish Audio brings you the taste and flavor of the Arabic world with this diverse collection of construction kits from the Middle East. Producer Ara Antranik delivers an incredible mix of rhythm and passion throughout his second release of the widely popular Hadeeth. Hadeeth 2 includes 66 construction kits in today’s most user-friendly formats?WAV, Apple Loops, REX, and RMX. The 66 construction kits range from 80 to 170 BPM and include exotic instruments such as the duff, mazhar, rak, tabla, sakat, tar, and duhulla. With a full mix of each kit and all the elements broken out into individual loops, it’s easy to capture authentic Middle Eastern flavor without ever leaving your studio. Unlike the original Hadeeth collection that combined a drum kit with Arabic percussion, this collection (also produced by Ara Antranik) is a pure hand percussion affair. You get 66 construction kits, each containing a full mix plus three to eight individual instrument loops including the duff, mazhar, rak, tabla, sakat, tar, and duhollah (all percussive instruments) played by Haythm Blat. About two dozen different regional and traditional styles are represented, sometimes played at different tempi (ranging from 80 to 180 bpm) or with variations on the same theme. A huge variety of oriental and ethnic percussion styles in 3/4, 5/8, 6/8, 7/8, 9/8, 10/8, 12/8 measure. User friendly cut, combinable with each other and ready to use also in a 4/4 track! Efkan Durmaz recorded a big variety of rare oriental grooves in high quality audio. To keep the natural warmth of the original sound, Neumann U87 microphones where used for the whole production. Arabic Percussion sample pack is a fresh new collection of awesome arabic and oriental percussion sounds. Recorded with best tool in professional studio environment this loops will spice your music productions and also are just great for film and cinematic productions. 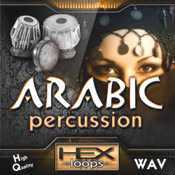 These Arabic Percussion Loops are just the percussion rhythms that will add the authenticity that makes any traditional track or film score come alive, but also modern rhythms that add an edge off to the traditional, and add a new flair to the ancient rhythms that originally inspired dance. This percussion sounds was recorded by Arabic professionals and contains loops and hits from tabla, taar, duff, tamborine with skin, congas, sakat (hand cymbals) and more. This collection spans a wide variety of Middle Eastern drums and percussion instruments. With a focus on a balanced collection we decided to offer as many performance elements as we could with multi-articulated, round robin, multi-dynamic layered sampled instruments. Each instrument that can be found in 1 of the 10 styles are extensively multi-sampled to provide you with a complete composing tool. There’s much to explore in this collection. Get yourself some inspiration from the top-notch performed percussion ensemble or build your own pallet of playable drums and percussion. 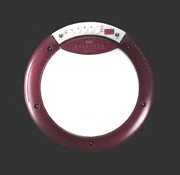 Sultan Drums ships with a user friendly and dedicated interface. It’s designed to work intuitively and give you quick access to this large collection of samples. As a composer you know what you need and we strive to bring it to you fast. With the philosophy of investing our resources in unique and authentic musical culture, we believe that we managed to create another one-of-a-kind with “Sultan Drums”. All performances are recorded on location in the Middle East with highly schooled, dedicated and talented percussionists. Beating any MIDI performance, a musician will always bring an extra feel to the music that just isn’t possible to recreate with a computer. Therefore Sonokinetic continue to believe in loops of dedicated performance sampling combined with multi-articulated instrument sampling. 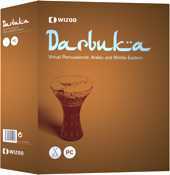 Darbuka has been discontinued for several years and is no longer being developed or supported. I include this even though it is discontinued as I found it an excellent resource and if you wish to track a copy down and are able to install it on an old computer you may find it very worthwhile. Darbuka features 2GB of performances by world-renowned percussionists Suat Borazan and Mohamed Zaki playing authentic instruments such as darbuka, douhola, bendir, riqq, sagat, tura, bongos and shaker. These original multitrack groove performances are derived from the cultures of Algeria, Arabian Gulf, Egypt, Lebanon, Libya, Morocco, Nubia, Sudan, Tunisia and Turkey. Styles include Ayoub/Zar, Baio, Chiftetelli, Churchuna, Dabkkah, Darig, Daza, Dishka, Fallahi, Fazani, Karachi, Jirk, Laz Havasi, Libi, Maghrebi, Maksum, Malfuf, Mambo Sudani, Masmoudy Kebir, Nubian Reggae, Nubian Samba, Rai, Roman Havasi, Rumba Khaligi, Rumba Masri, Saidi, Samai Thakil, Sufi, Sudasi, Tom Tom, Wahda, Wahrani, Wals, Zafa and Zorofat. Timing effects (tight/loose, quantize, swing). The integrated mixer includes independent EQ, punch, and ambience adjustment for each instrument. Users can place instruments freely in one of 15 different surround stages, as well as play patterns, fills, solos, variations and mutes via MIDI keys. Instrument combinations can be stored in 61 scene memories. Outputs are provided main stereo/surround plus 14 individual instruments. Learn the fundamentals of Turkish music with audio, visual and animated tools. I include this even though it is not dedicated to Turkish rhythms. Mus2okur is a software program that teaches the basics of Turkish music. It has been designed for beginners as well as seasoned musicians wanting to discover the longer usuls, less-known maqams and more, you may find it very worthwhile. Mus2okur includes information on nearly 25000 musical works in its database. Of these works, approximately 1300 are available as sheet music and can be played with MIDI and Turkish music instruments with the score and lyrics displayed on screen in "karaoke" style. Mus2okur presents the fundamental concepts of Turkish music such as maqam, form and usul with audio and visual examples. The software comes with an expansive database of information on prominent composers, lyricists, compilers and other notable people including photos, biographies and lists of works. Korg announces the new Wavedrum Oriental Dynamic Percussion Synthesizer, a limited edition version of Korg's popular Wavedrum designed specifically for Middle Eastern music. The Wavedrum Oriental boasts a massive infusion of popular, unique and accurate percussion sounds, all playable from the Wavedrum's dynamic rim and real drum head surface. 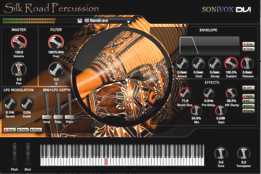 Featuring more programs than the original Wavedrum, it offers new, specialised algorithms and samples designed for the percussionist seeking the very highest quality Middle Eastern percussion sounds. Percussion of the Middle East owes its groove and exotic atmosphere not just to its non-Western music theory and unique performance techniques, but also to the distinctive sound of specific percussion instruments arising from various musical cultures of the area. New samples featured on the Wavedrum Oriental are dedicated to various instruments such as Darabuka, Danhola, Drinkga, Sagat, Riq, Def, Tar, Bendir and many more. The striking surfaces of these instruments are simple, yet they are able to produce a wide range of timbres. The Wavedrum is distinguished by its revolutionary synthesis technology and by an interface that allows a direct physical method of performance, making it the ideal instrument for replicating and articulating these exacting sounds. All of the Wavedrum Oriental's new sounds faithfully simulate the distinctive ways in whichtone is affected by subtle nuances in playing technique and the position of the strike on the instrument – the Darabuka with its thin single skin, the Riq with its single skin and jingles and the dual-skinned Bendir, for example. The Wavedrum Oriental's appearance has also been enhanced. The body is a white tone reminiscent of a high-quality Darabukka's ceramic body, complemented by a deep red wine-colour rim. Khbeti 6/8  Soudasi 6/8  Laf 1  Wehda 1 [120 Laf 2 Wehda 2  Maksoum 1  Wehda 3  Maksoum 2  Zaffa [96.